I was on the Drew Mariani Show on Friday afternoon (broadcast in metro Chicago) discussing a new theory about the crossing of the red sea. Carl Drews, a fluid dynamics scientist in Colorado, decided to analyze the biblical account of the parting of the Red Sea (or Sea of Reeds) from a physics perspective as his masters thesis at the University of Colorado at Boulder. Drews argues that an overnight east wind of 63 mph or more would be sufficient to blow back several square miles of water to a depth of six feet. 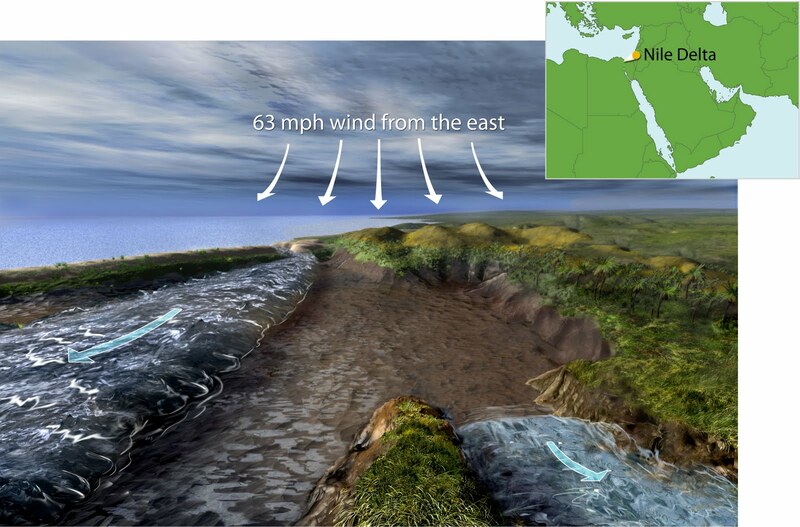 Working with topographical maps, he thinks he has identified a place in the Nile Delta where such a wind would have provided a draw path to the Sinai Peninsula. Click on the title of this post to read more. Drews' work is intriguing, but I'm not jumping on the bandwagon yet. I don't have the time to analyze all the relevant data, but my gut instinct is that, although Drews is correct about the fluid dynamics, there are probably textual or archeological data that militate against this location as the actual site of the crossing. Feel free to comment if you know something about this topic. What about the other famous "crossing", the Jordan River? Did the "east wind" blow through there too? Isaiah 51:10 Was it not You who dried up the sea, the waters of the great deep, who made the depths of the sea a way for the redeemed to pass over? Galatians 4:25 for this Hag̅ar is Mount Sinai in Araḇia, and corresponds to Yerushalayim which now is, and is in slavery with her children. There has to be evidence for the Stories in the Scriptures,... and there IS.